Audio books are a great form of entertainment. 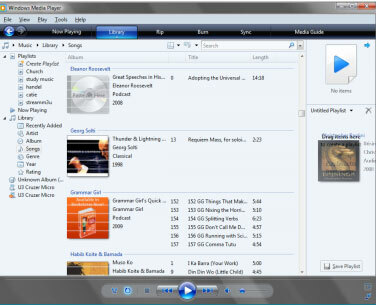 Windows Media Player provides an easy way to listen to and store audio books on your computer. 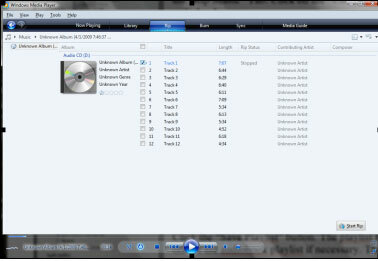 This tutorial will teach you how to add audio books from a CD quickly and easily to Windows Media Player. Skip steps 1 and 2 if you downloaded the audio book. Insert the audio book CD. Click on the "Rip" tab. To make the audio book easier to find, click on "Rip>More Options." Then, select the "Rip Music" tab. Click on the "Change" button and add a new folder for your audio book. Select the files you want to rip from the the CD. Click on "Start Rip." Media Player will display the rip progress in the rip status column. Note: You can still listen to your audio book while it is being ripped. Repeat steps 1 and 2 for the remaining audio books. Click on the "Library" tab. If your album is not in the library, click on "Library>Add to Library." Then, click on the "Add" button. Find your audio book folder and add the folder to the Media Player's library. Locate your audio book under the album column, with the library tab selected. Drag and drop the album in the sidebar where it indicates, "Drag items here to create a playlist." You can drag single files or multiple albums into your playlist. For example, you could combine a book series that is divided into separate albums into one playlist. Click the "Save Playlist" button. The playlist title text box will be highlighted. Rename the title of the audio book playlist if necessary. Then, press "Enter."